HAMPI. A name that evokes intrigue and mystery. Many people who travel in India cite Hampi as their favourite place. They usually mention the vibe or energy of the region, the size and scope of the abandoned city, and the priceless beauty of the monuments. But like most places, you cannot really fathom it until you visit. On this trip to India, I made a very deliberate decision to finally visit four top destinations that have eluded me on eight previous trips to India: Hampi, Khajuraho and Amritsar / The Golden Temple. And I chose my visit to Hampi to coincide with the “super moon” that rose in the sky on November 14. 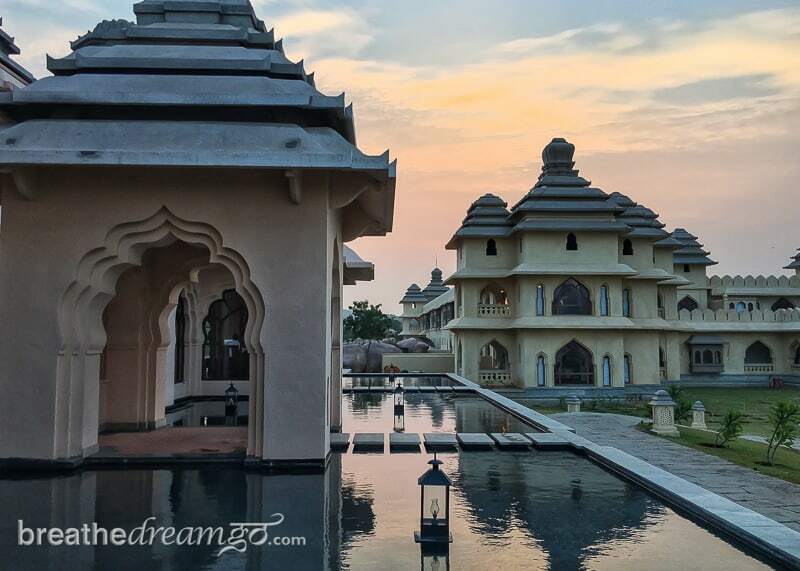 When I arrived in Hampi, I went straight to the Orange County, Hampi palace hotel. 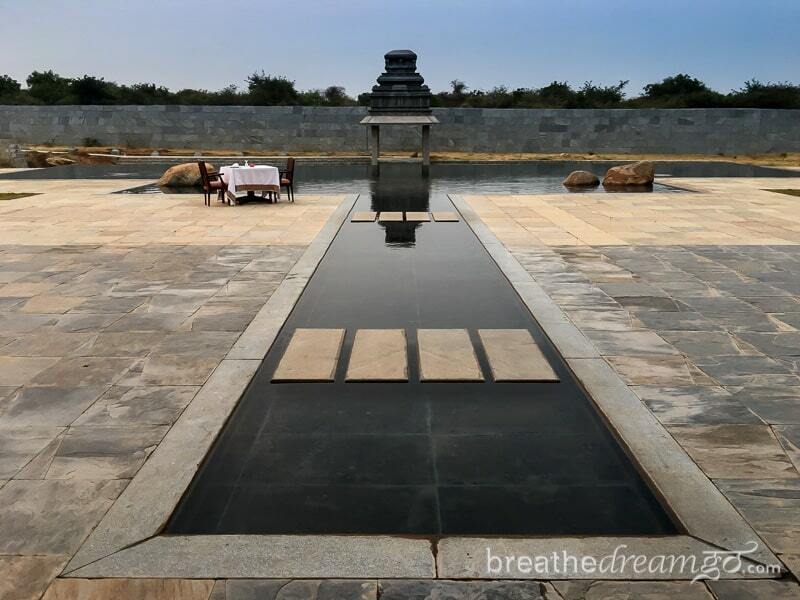 A new luxury property, Orange County is only a few kilometres from the monuments of Hampi and can almost compete with them for beauty. I was invited to stay at the property to experience it and can only say I am extremely impressed with both the incredible detail that went into the design of this monumental palace and also the intimacy and excellence of the service. The staff are warm, natural, professional and efficient. I have rarely experienced such service. After a cool welcome drink, the hotel’s historian came to meet me with a leather map of Hampi and advise me on a program for seeing the vast UNESCO designated heritage site. Hampi was the main city of the Vijayanagar Kingdom that ruled central India for about 200 years, between the 14th and 16th centuries. It was conquered, partially destroyed, and left to languish among prehistoric rocks and palm trees … eventually attracting the attention of historians, archaeologists, tourists, and hippies. 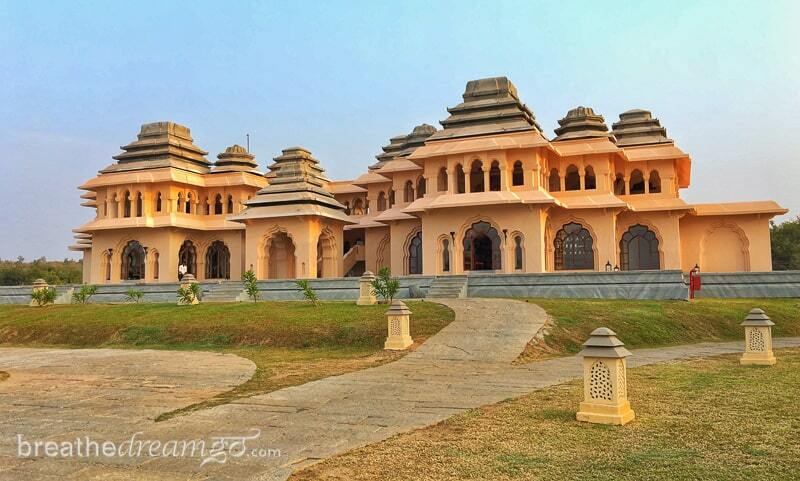 It’s the vast size of Hampi, as well as the beauty of the monuments, that stuns visitors, me included. If this historic site was in Europe, it would be beyond famous. For more than 25 square kilometres, the monuments and temples of the abandoned city spread out in an embarrassment of riches. It was one of the richest and largest cities in the world in its time. I was told it takes a week to see the entire site. 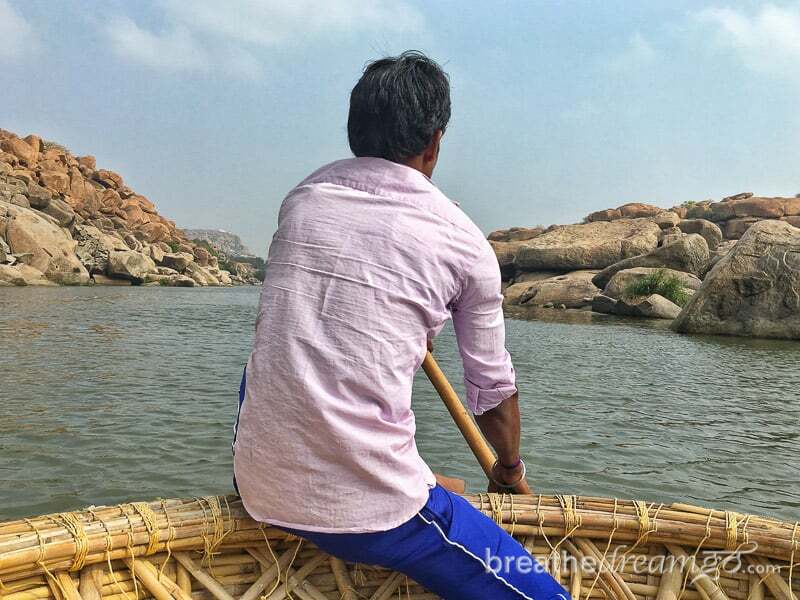 Unfortunately, I wasn’t in Hampi for a week, so I only saw a small portion – though that was enough to blow my mind. Early on the first morning, of my stay, I was met by the Rajesh, my guide, and Shekhar, my driver and together we piled into the Orange County’s modified vehicle to head to the monuments, which officially open at 8 a.m. Starting in the centre, at sunset point, we walked among the temples and then along the river to a peaceful spot where we rented a coracle and then stopped for tea. At the local tea stall, we sat beside a Swiss man named Andy, who had the piercing eyes and calm demeanor of a guru. One of the first things he said, with a laugh, was “there’s no hurry,” and I felt the wisdom of it. Andy has lived in India for 20 years, criss-crossing it many times on his motor bike for his export business. He said he spends most of his time outdoors. 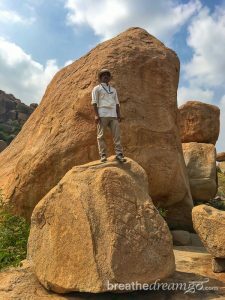 Currently, he was living surreptitiously among the rocks of Hampi. 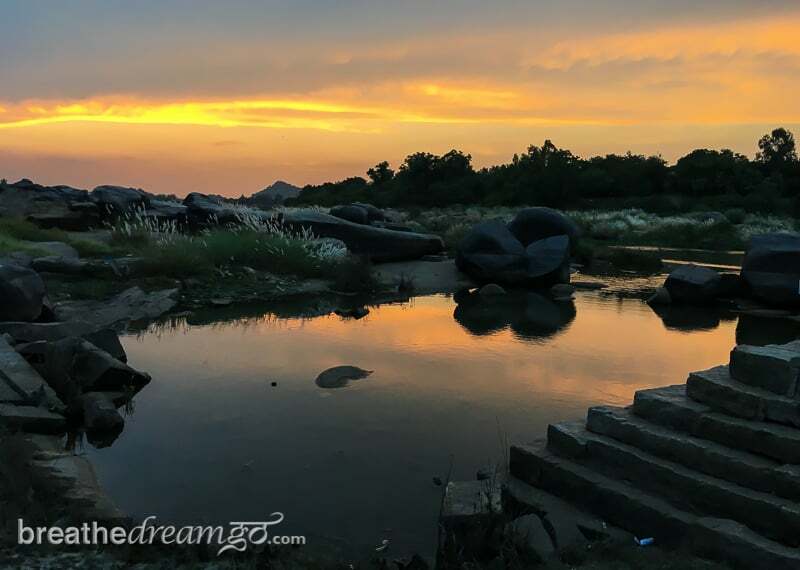 From Andy’s perspective, Hampi is “ruined” because officials have come in and raised fences and cleared out the hippies who used to camp here. They now stay in a backpacker village across the river from the main temple area. You have to go by boat to get there. A dusty road that runs alongside a farmer’s field is lined with small guest houses and outdoor cafes, a jumble of plywood and twinkle lights. From my perspective, Hampi is the better for it. 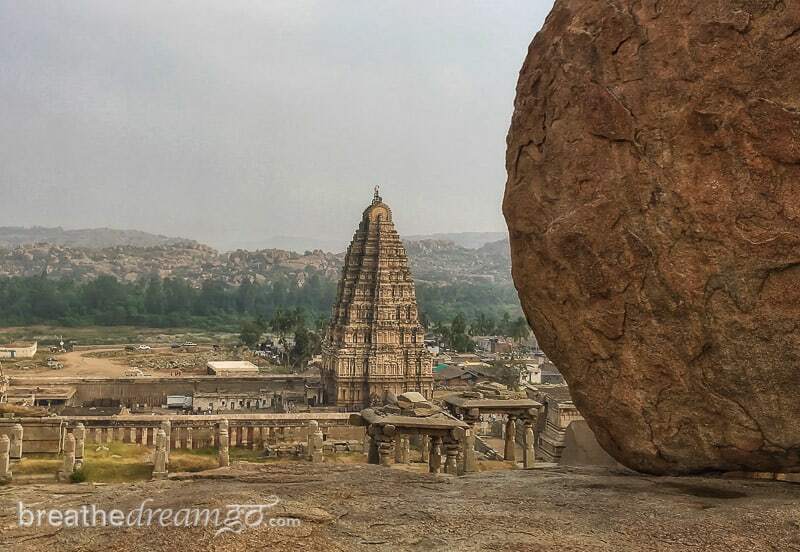 I felt immediately the profound peace of Hampi, and loved the prehistoric look of the rocks, hills and monuments. Early morning, it was cool and empty, definitely the best time to go. At about 11:30, when it got hot and the blazing sun made photography difficult, we headed back to Orange Country for lunch – and a swim in the black granite lined pool. Later in the afternoon, Rajesh and Shekhar again picked me up and we drove to Matanga Hill to watch the sunset and wait for the super moon to rise. The sun set was lovely. 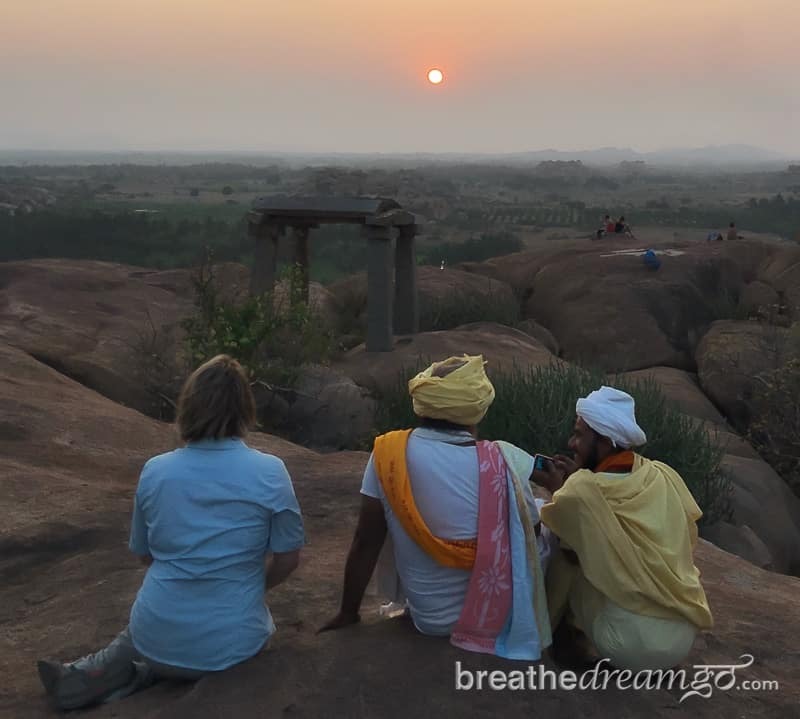 We met a friendly spiritual teacher, Shanti Das and his joyful student, Kundan Das, and sat with them to watch the sun go down across the expanse of Hampi. Watching the sunset … later, turned around and watched the super moon rise! Together we laughed and enjoyed the simplicity and beauty of the moment. No shared language was needed. We shared the language of humanity. It’s moments like this that make me a traveller. After the sun set, everyone left and Rajesh and I stayed back to wait for the moon. We didn’t have to wait long. To my utter amazement, we saw a huge orange ball rise above the line of temples and monuments to the east of where we were sitting. We were awestruck. I started chanting OM spontaneously. Rajesh told me it was the first moon rise he had ever witnessed, and the pure innocence and joy in his face alone made all worthwhile. It was my dream to see the super moon rise in Hampi, and I did. I never cease to be amazed by the power of dreams, if you believe in them, and take actions towards them. If you breathe into them as it were! Then back to the palace we went. I grew to really enjoy it when we drove through the castle-like gates and Rajesh always said, back to the palace! At my first sight of Orange County I was a bit awestruck. I was struck by the sheer size of the palace hotel and also the pristine newness. I am accustomed to Rajasthani palace hotels that wear the patina of age. But Orange County is newly built – albeit on traditional lines. The surreal feeling continued as I walked into the open-air lobby. Spacious and unadorned, it’s starkness was almost shocking. Though impressive at first, it was really on familiarity that I began to appreciate Orange County. As I learned about the incredible amount of care and work that went into the design, I began to see the genius of the place. It’s essentially based on two things. 1. Design. Orange Country won a Best Designed Boutique Hotel award this year. I bet the judges didn’t take as long as me to see the play of stone and granite, the many-layered geometric patterns that appear wherever you look, the black-tiled pool, the use of water pools, the antique fixtures, the heavy wood furniture … and on and on. There is a consistency of vision at Orange County that becomes ubiquitous and that is extraordinary, especially in this day of pre-fab structures and cost-cutting. No costs were cut at Orange County, no design elements sacrificed. It’s a work of art. And it’s comfortable, too. The starkness of the public spaces gives way to padded comfort in the suites. I toured all four categories of room, and all are special and impressive. 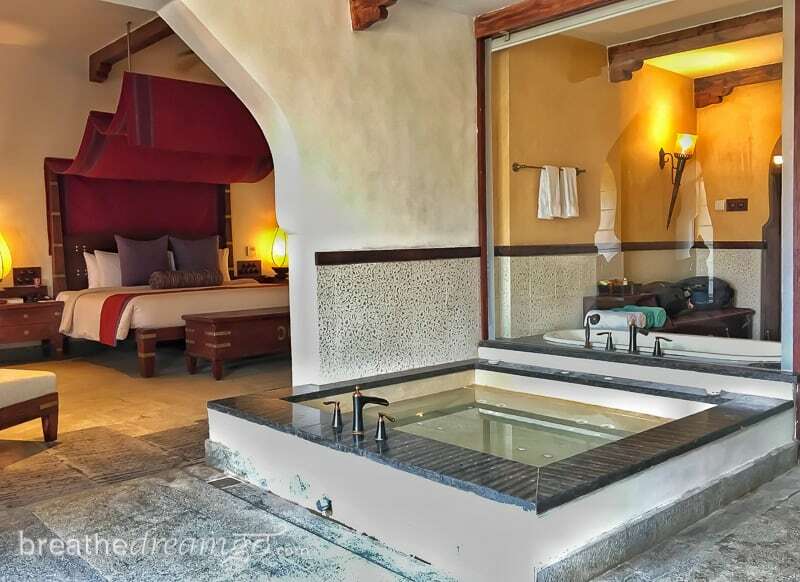 All rooms share canopied beds, in-room granite whirlpools, large soaker tubs and terraces. The Jal Mahal rooms, which are really villas, also feature large living rooms and private pools. My favourite are the Zenana rooms, only four, one at each corner with terraces open to three directions. Perfect for sunrise, sunset and moon viewing. But the single most impressive item in each room is a water spigot attached to a hidden filter. Fresh, clean water is readily available at all times in the rooms, so there is no need for plastic water bottles at Orange County. 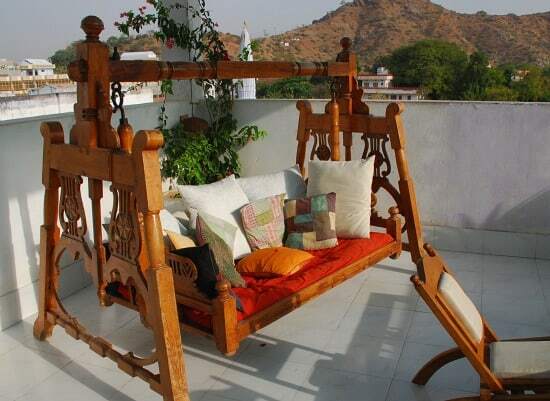 Every hotel in India should install this amenity! Orange County is making a dedicated effort towards sustainability. 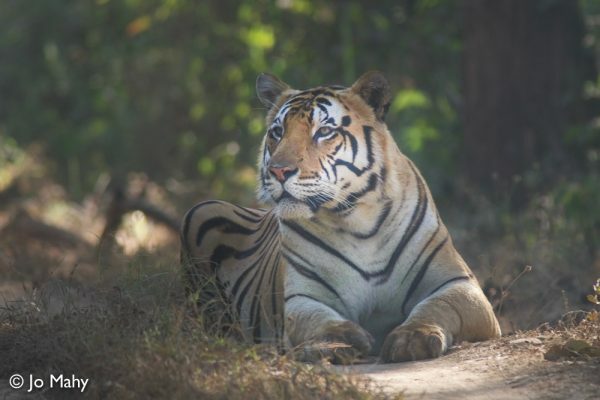 In fact, the Orange County, Kabini was nominated for an Indian Responsible Tourism Award from Outlook Traveller India. My suite, complete with pool is in the mid-range category. 2. Service. Sometimes magnificent architecture comes at the expense of service. Not so in the case of Orange County. 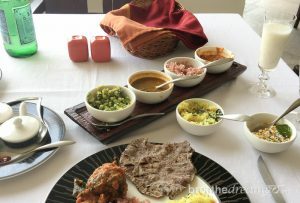 From the moment I arrived and met manager Abhishek, to the waiters and housekeeping staff and of course the very special guide Rajesh, I never ceased to be amazed at the warmth, ease and professionalism of the staff. There is an intimacy in the way service is offered here that, in combination with the stunning design, makes for a unique and frankly awesome combination. Just a few examples. They came to know I like fresh lime soda, mixed (sweet and salty). At every meal, they brought me one moments after I sat down. Before I arrived, they enquired about my diet and found out I have to follow a gluten free diet. I later discovered the chef actually researched to find out what I could eat. Every meal was carefully prepared to avoid gluten. Replacement breads, and thoughtful suggestions, were made. Every day, sweets and fresh fruit are placed in the room, and at turn down, my bed was sprinkled with rose petals. I will long remember the genuine care and consideration bestowed on me during my stay. The philosophy of “Atithi Devo Bhava” (guest if god) was in full force, and I was made to feel completely at home. Finally, a word about the food. I don’t write a lot about food, I’m not an expert. But I know enough to know the food at both restaurants at Orange County was superb. The main restaurant serves a wide-ranging menu from continental to local specialties. The restaurant in the Lotus Mahal serves the cuisine of the Nawabs and it was luxurious and mouth-watering, as it should be. My trip to Hampi was way too short. I only saw a small portion of the monuments, and never visited Anegundi. But I made up for a short visit by having a very rich visit, immersed in opulence, kindness, magic moments and the magnificence of one of the world’s great heritage sites. My deepest, most humble thanks to everyone at Orange County. After only three days, I felt like family and I miss you all. 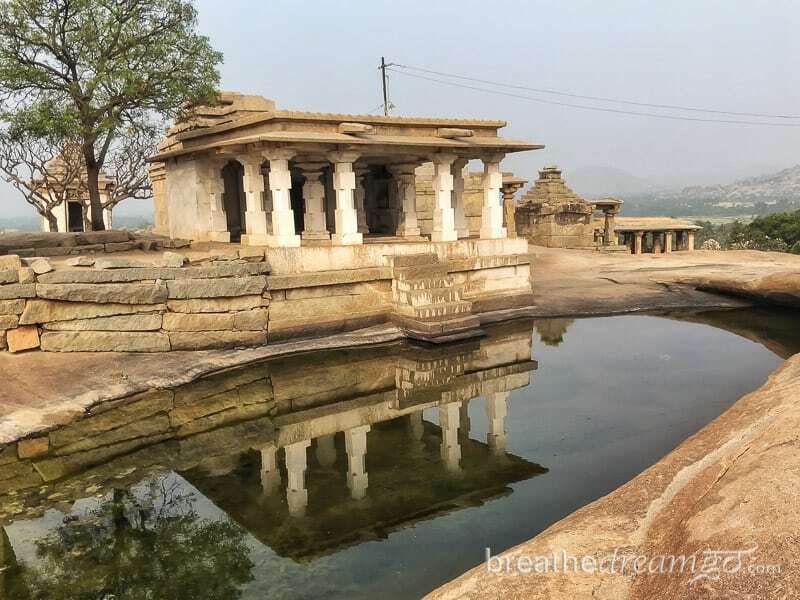 And thanks to Lakshmi Sharath, whose beautiful post about Orange County and Hampi inspired me to go in the first place! NOTE: I was hosted by Orange County, who also provided my tours and transportation. As always, my opinions are my own, my stories are heart-felt and I only make recommendations based on personal experience and with the needs of my readers in mind.